Posted by Laurel on November 17, 2014 in 10 Points, Rome, The Best! Sometimes we get to eat pizza more than once a week. Vacations and holidays call for such indulgence. Since we had not been to our number 1 favorite pizzeria in a while, we took the opportunity to go on a Monday night before the Veteran’s Day holiday. We figured the crowd would not be too bad on a cool November Monday, and upon arrival about 20:00 it was manageable: we got right in. by 21:00 there were people waiting in the vicolo. 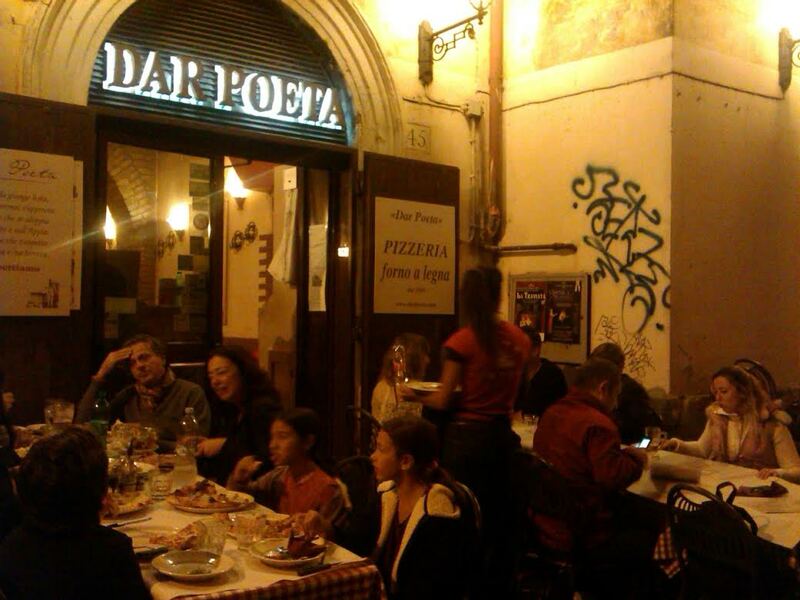 Outside Dar Poeta in Trastevere. So popular that even on a cool November evening people were eating outdoors. This is a unique pie in a humble place that attracts a crowd every evening. Open Noon-Midnight, it is certainly a lunch option, but pizza in Rome is for dinner. We first discovered DP 4 years ago when we did indeed have lunch there (crazy Americans). It was very hard to find the first time, in the twisting alleys of Trastevere. Now we can find it blindfolded. Dar Poeta is also economical: no fancy wines just house white or red, beer, bruschetta, huge salads and wonderful pizza that is ready in a flash. This is not a place to linger. I prefer the pizza sarmonata, which is salmon, Gorgonzola, mozzarella and arugula. Ric leans toward the lingua fuoco made with salami piccante. We try to branch out with limited success. This week, Ric branched out and I dove into a pizza I have been craving for weeks. 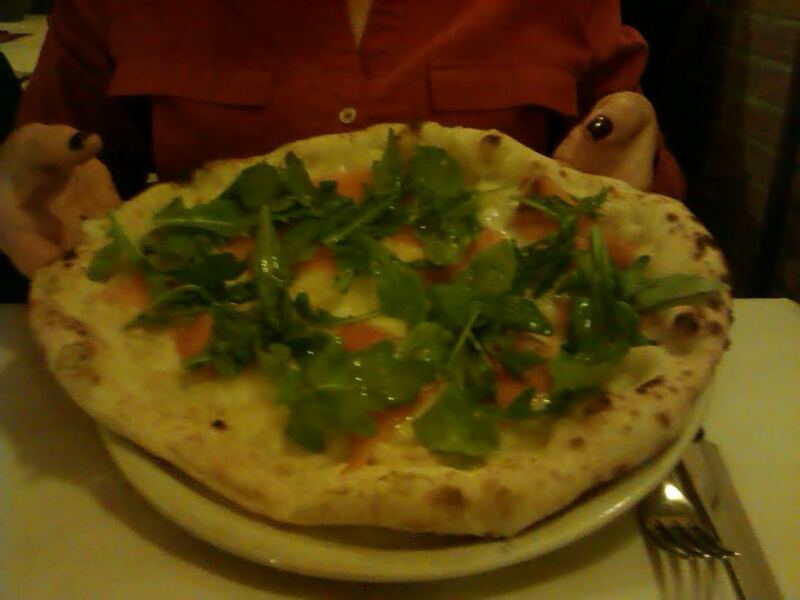 Lots of Roman pizzerias do a salmon pizza, but no one as well as DP. Their salmon is not as salty as others. 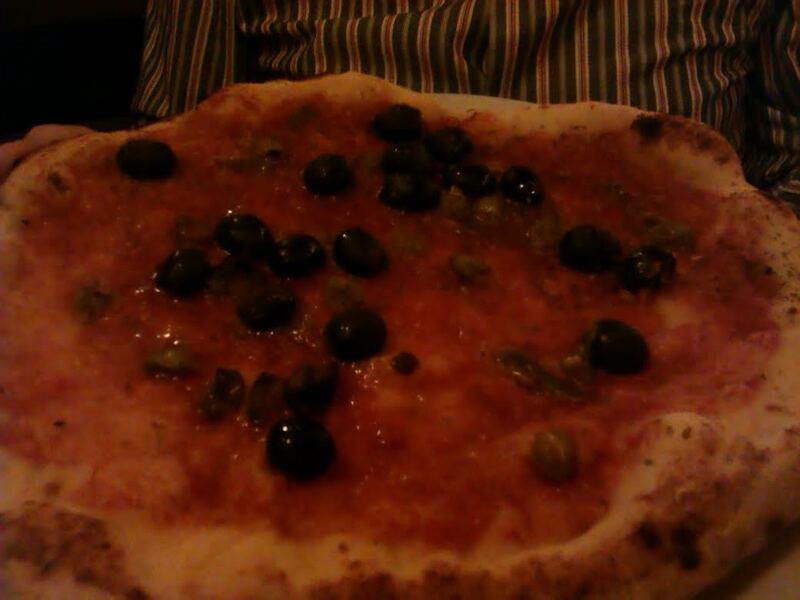 Ric’s choice, pizza capponari with olives, capers and alici (anchovies). My pizza sarmonata looks pale: no sauce, a “pizza bianca.” But my-oh-my is it tasty! Pizza Quality: 3 Outstanding ingredients, an extraordinary crust and creative toppings. Pizzas are filling so unless you are ravenous, beware of ordering a salad as they are gigantic. Service: 3 Efficient, friendly, bi-lingual. These servers hustle! Ambiance: 3 Cute, rustic, crowded dining rooms, tables very crowded. Limited outdoor seating; absolutely not romantic but lively. You are likely to get to know the people seated next to you. Bonus: 1 Extra credit just because we love it! Returnability: The Best: Go out-of-your-way to eat here; take a cross-town bus or a 20 Euro cab ride if necessary.